There are those who say that "Just because you CAN do something, doesn't mean that you SHOULD." To them I say, "But sometimes it DOES mean you should." 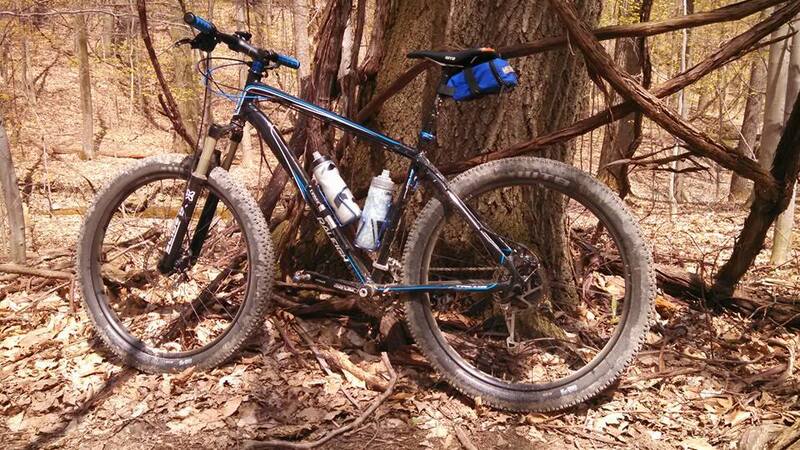 Case in point, "plus-sized" tires on your mountain bike. First, a bit of background. What are "plus-sized" tires? The term "Plus" when it comes to bike tires is generally used to refer to tires that range in width from 2.8 inches to 3.25 inches. Sometimes called "mid-fat," they are wider than your typical mountain bike tires, but not as wide as your true "fat" bike or "snow bike" tires. The idea with plus tires is that you get some of the benefits of uber-traction like with fat bikes, but less of the disadvantages, like all that extra weight, plus the "self-steering" feeling you can get with some fat bike tires. Surly Bikes, being the under-appreciated vanguard of things new and cool in the bike world, first came up with the idea of plus-sized tires. Their Krampus came out in late 2012, featuring the first plus tire, the Surly Knard 29x3.0. I had the opportunity to first test-ride the Krampus at Interbike 2012, and was sold on the idea from the start. We ordered a few of the Krampus for stock in our stores, and they hung around for quite a while before we finally sold out. I think that Northeast Ohio wasn't yet ready for the "plus" concept yet. Or, maybe people were intrigued, but figured, "If this is version 1.0 of this idea, maybe I should wait and see what version 2.0 looks like?" What do you think? Surly followed up on the Krampus in 2013 with the ECR, what they referred to as "the love child of a Krampus and a Long Haul Trucker." Designed for off-road touring, the ECR combined the 29+ wheels of the Kramps with upright touring geometry. I test-rode the ECR at SaddleDrive 2013, and again, was hooked. 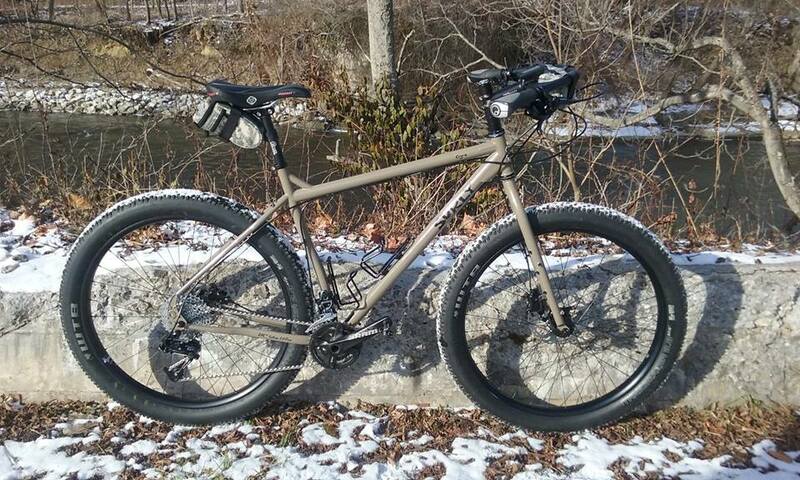 I bought my '14 Salsa Mukluk 2 fat bike at the beginning of 2014, and enjoyed it through that snowy season. Come springtime, I was looking for a way to liven it up for the summer, so I bought a pair of the Surly Knard 29x3.0 tires and Surly Rabbit Hole 29er rims (the same ones that come on the Krampus and ECR), plus a pair of Salsa hubs, and had our ace Service Manager Rich lace them up with DT Swiss double-butted spokes. 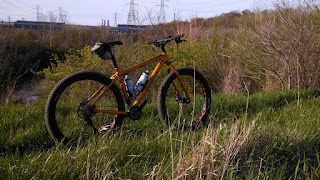 I took the first test-ride with this setup on the Cleveland Metroparks Ohio & Erie Canal Reservation Mountain Bike Trail. The ride was as fun as I had hoped. The rigid fork does beat me up a bit, but I was used to riding a rigid off-road bike already. 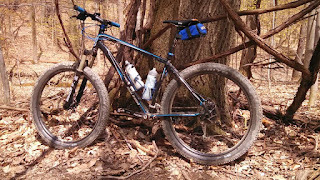 I continued to ride this as my primary mountain bike throughout the rest of the season, including at the Royalview Trail, Bedford Singletrack, Mohican State Park, and topping off the season with the Iceman Cometh Challenge race in Michigan. My full-suspension mountain bike sat in the basement collecting dust. 2015 rolled around, and I, being one who likes to tinker, experiment, and be on the bleeding edge, was looking for a way to build a new biking experience without building a new bike. 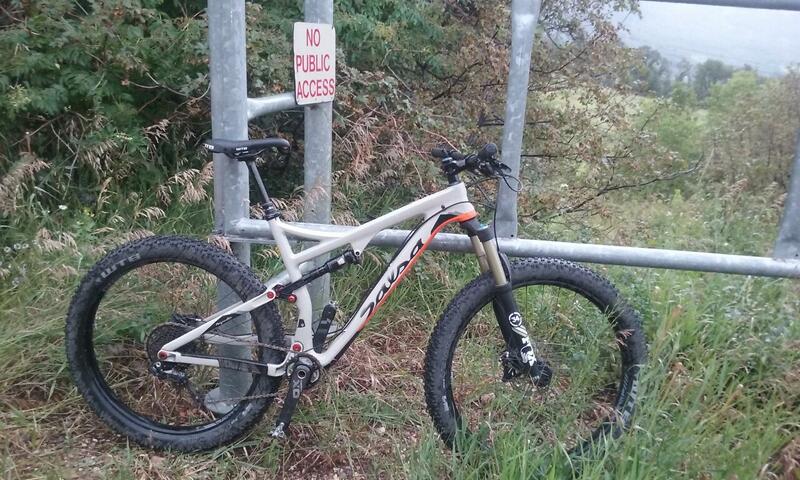 I had a 2013 Raleigh Talus 29er that I had acquired from my friend Sean at Main Street Cupcakes. I had been doing some reading that many 29er mountain bikes could fit 27.5+ wheels. The outer diameter of a 27.5+ wheel is almost the same as a regular 29er wheel, and most 29er frames have enough clearance to fit the width of a 27.5x2.8 tire. So, I bought a pair of Velocity Dually 27.5 rims and WTB Trail Blazer 27.5x2.8 tires. We had a nice pair of old Real Mountain Hubs in the store, so once again, I had Rich lace them all up. The Raleigh, with a suspension fork and the 27.5+ wheels, was everything you want in a hardtail mountain bike and more. The fork took the edge off the bumps and roots, while the plus tires grabbed the dirt, allowing me to rail corners and maintain speed. Most forks, both rigid and suspension, have plenty of tire clearance to spare, and that was the case with this one and the 27.5+ tires. In the back on the Raleigh Talus 29er frame, it was a little tight between the chainstays and seatstays. Manufacturers recommend at least 6mm of clearance on either side of the tire for safety, since frames flex when ridden. I had less than that, and I did get a little tire rub when pushing the bike hard. 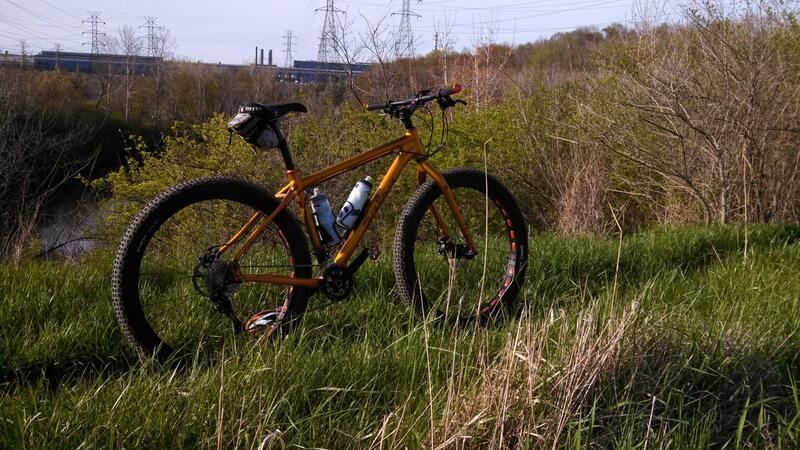 The plus wheels on the Fargo make this bike a little more playful compared to its standard 29er wheels. It's perfect for smooth, flowy singletrack like you'd find at the Bedford Reservation, and perfect for the warm and dry conditions we had late into the season last fall. I took it to the East Rim Trail on opening day last October, just because it was the bike I happened to have with me that day. The tires worked well on that trail, although the weight-forward position of the drop-bar Fargo was a bit tough to handle on that trail. This setup would be perfect for an extended back-road/off-road multi-day tour. Tire clearance in the Fargo frame was better compared to the Raleigh. While still less than the recommended 6mm, I've never had any problems with tire rub. 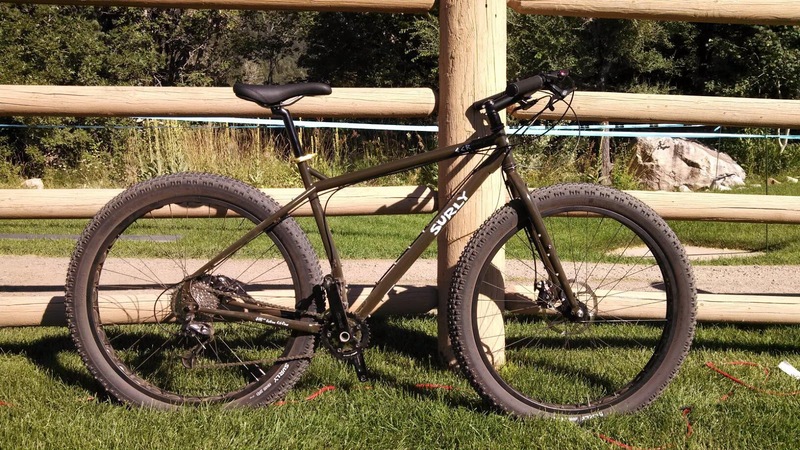 For the 2016 model year, Salsa Cycles, following in the footsteps of their sister brand Surly, released the first full-suspension 27.5+ bike, the Pony Rustler, which I had the opportunity to test-ride at SaddleDrive 2015. In the meantime, last year I had to downsize my bike collection due to moving, so the Raleigh Talus 29er had to go (I kept the 27.5+ wheels and sold it with a pair of regular 29er wheels). My latest bike acquisition in January was a Surly Ogre. This was one of those bikes that I didn't really have a need for, but I've always loved the "Tannish Gray" color, and at that time, I noticed that Surly was down to one left in stock in my size, so I grabbed it and built it up with some parts I had around, and put my 27.5+ wheels on it. The Ogre is designed to handle up to 29x2.5-inch tires. Clearance with the 27.5x2.8 tires was better than on the Fargo, and I have not had any tire rub issues. 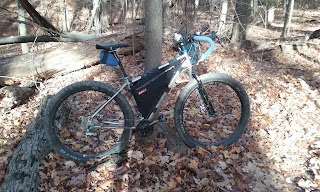 Both the Ogre and the Mukluk with have been my go-to mountain bikes this season; I've probably ridden them both about 50/50 when I hit the trails. Think of this Ogre like a "poor man's ECR" -- 27.5+ instead of 29+ wheels, although the Ogre shares frame geometry with the Karate Monkey, so it's a little more singletrack-friendly compared to the ECR. At over 33 pounds, it's a bit of a pig going uphill, but my SRAM 2x10 drivetrain with 11-36 cassette gives me plenty of gearing to crank it up, however slowly that may be. This bike would be perfect for a multi-day off-road tour. Get a RockShox Bluto fat bike suspension fork for my Salsa Mukluk, and rebuild my wheels using the Velocity Dually 27.5 rims, WTB Trail Blazer Tires, and Salsa fat bike hubs. Decide which of my current bikes I can live without, and buy a new dedicated 27.5+ hardtail, such as the Salsa Timberjack GX1 27.5+, which we will soon have IN STOCK!